by W.T.Collins, BA. Coat of Arms no 161, Spring 1993. Coat of Arms no 161 Spring 1993. 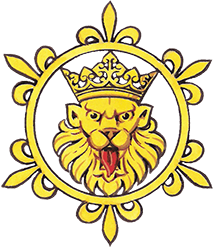 This brief article is a result of the writer’s interest in Spanish heraldry; it makes no claim to original research as it relies on secondary sources which are listed in the notes. The writer hopes that others will be able to comment on, correct, and add to the information contained here. Sir Anthony Wagner’s “Catalogue of English Mediaeval Rolls of Arms” (CEMRA) lists all English rolls of before 1500: in Spain, as Señor Faustino Menéndez Pidal de Navascués has observed, the problem is that “these works change gradually from the concept of armorial (lists of identified arms) to that of nobiliario (account of families with their origins, genealogies, etc., which also give their arms as mere illustration)”.6 Armorials produced down to the end of the 16th Century have been included in the list below. Spanish armorials are listed by M. Santiago de Rodriguez in “Documentos y manuscritos genealógicos”, Madrid, 1954, and Dr Martin de Riquer gives details of five Catalan armorials in “Heráldica catalana des de l’any 1150 al 1550”. The seven armorials edited so far are indicated in the provisional list that follows. The writer is trying to compile a more detailed catalogue: any additional information on the armorials listed will be welcome, as will information on any not included. Can anyone supply details of the Armorials of Murcia and Castilla; are there any more Spanish armorials in collections in the Low Countries? Are there any Spanish armorials in Italy? Considering the political ties between Spain and Italy during the 16th and 17th Centuries there well might be. Libro de la Cofradía de Santiago de Burgos (Burgos, Municipal Archives). Institutional armorial: original painted book of 311 knights with arms on shields and horse trappers; compiled between 1338 and 1543. Edited by F. Menéndez Pidal de Navascués as El libro de la cofradía de Santiago de Burgos, Bilbao, 1977. “Primer de Chrestià” of Fra Francesc de Eixemenis. Catalan descriptions, not blazon, of arms of 19 kings. 1379-81. Edited Valencia, 1483. “Vesió” of Bernat de So: poem, containing Catalan blazons of arms of fourteenth Christian kings: 1381-82. Edition by A. Pages, La “Vesió” de Bernat de So et le “Debat entre Honor et Delit” de Jacme March, “Bibliothèque Méridionale”, Toulouse-Paris, 1945. Armorial Cervellón. 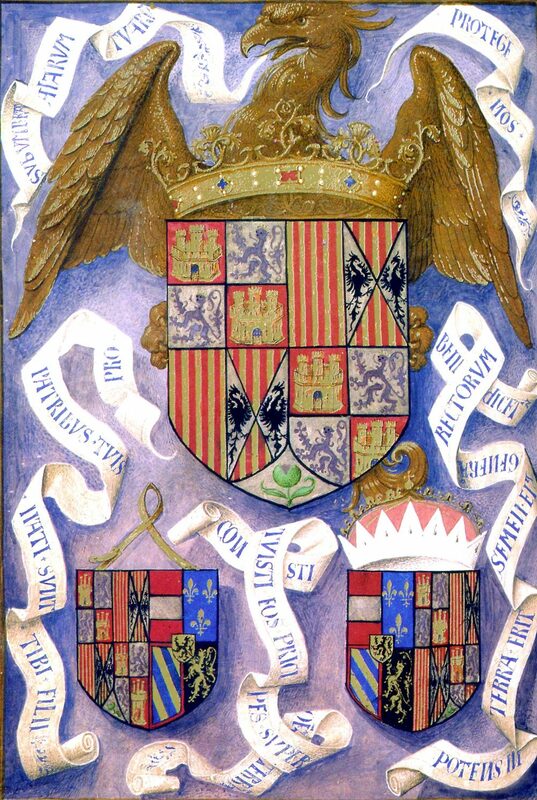 General roll: lost painted armorial of 447 shields of Spanish nobility, compiled by Diego Cervellón, 1455-79. Edited by P. Adam as “Le recueil de noblesse d’Espagne fait par un historio¬graphe du Roy Jean II nommé Cervellón”, Hidalguía, Year XII (1964), 833-56, from 17th Cent, copy by P. Chifflet, Bibliothèque de Besançon, MS 165. Armorial de Steve Tamborino (Armorial de Salamanca). (Salamanca, Biblioteca de la Universidad, MS 2490). Original painted book: heraldic treatise and armorial of shields of kings, and Catalan, Aragonese, Valencian, Castillian and Neapolitan nobles and gentry, compiled by Steve Tamborino, c. 1516. Folios of Castillian arms reproduced by Martin de Riquer, Heráldica castellana en tiempos de los Reyes Católicos, Barcelona, 1986. Armorial Catalan de Steve Tamborino (Toulouse, Municipal Library, MS 798). Probable original painted book: heraldic treatise and armorial, shields of Catalan nobility and gentry, copied from Catalan section of Armorial de Steve Tamborino, c 1516/19. Edited by P. Adam as “Traité du blason et armorial Catalan de Steve Tamburini”, Boletín de la Real Academia de Buenas Letras de Barcelona, XXIX, 1961-2, 359-407; some folios of arms reproduced by Martí de Riquer, Heráldica catalana des de l’any 1150 al 1550, Barcelona, 1983. Armorial dels canonges (Barcelona, l’Arxiu Episcopal). Institutional roll: drawings and blazons of 39 shields of arms of members of Chapter of Barcelona Cathedral, compiled by Francesc Tarafa, 1536. Edited by Martí de Riquer, Heráldica catalana des de l’any 1150 al 1550, Barcelona, 1983,745-55. Crónica de cavallers Catalans. Lost chronicle, by Francesc Tarafa, 1546-50, with 418 shields of Catalan arms. Edited by A. d’Armengol i de Pereyra, Crónica de cavallers Catalans, Barcelona, 1952-4, from 17th Cent, copy by Jaume Ramón de Vila. Libro de armería del Reino de Navarra (Pamplona, Archivo General de Navarra, no. 302). Book, official armorial of Kingdom of Navarra: 784 painted shields of arms of Navarrese nobility and gentry, compiled 1572-5. Edited by (1) F. Menéndez Pidal de Navascués, Libro de armería del Reino de Navarra, Bilbao, 1974; (2) Juan José Martinena Ruiz, Libro de armería del Reino de Navarra, Pamplona, 1982. Armorial espagnol (Paris, Bibliothèque Nationale, MS Fr. 32675). Book: 62 painted shields of Spanish noble families, 1580. Edited by Michel Popoff, L’Héraldique espagnole et catalane a la fin du Moyen Age, Paris, 1989, 118-23. Libro de la cofradía de Santiago de Burgos; “un pequeño armorial”; Armorial de Steve Tamborino; Armorial Catalan de Steve Tamborino; Armorial de Llupiá, Libro de armería; Armorial de Bernat Mestre I; Libro de armería del Reino de Navarra; Armorial espagnol; Armorial de Basilio de Labrit y Navarra; Libro de San Salvador de Leire. Armorial de San Pablo de Tarazona. Libro de la cofradía de Santiago de Burgos; “un pequeño armorial”; Armorial de Steve Tamborino; Armorial Catalan de Steve Tamborino; Armorial de Llupiá; Armorial dels canonges: Armorial de Bernat Mestre I; Libro de armería del Reino de Navarra; Armorial espagnol. Armorial Cervellón; Blason d’armas; Blason y recogimiento de armas; Blasón de armas abreviada; Armorial de Bernat Mestre II; Crónica de cavaliers Catalans. Armorial Vermandois; Armorial Bellenville; Armorial d’Urfé; Armorial Charolais; Armorial le Blancq; Armorial de Valenciennes; Armorial Gelre; Reyneck Roll. The Spanish sections of the first six of these armorials have been edited by Michel Popoff as “L’héraldique espagnole et catalane à la fin du Moyen Age”, Documents d’héraldique mediévale, 5, Paris, 1989. Juan José Martinena Ruiz, Libro de armería del Reino de Navarra, Pamplona, 1982,37-8. Martin de Riquer, Heráldica catalana des de l’any 1150 al 1550, Barcelona, 1983, 61-2. Martin de Riquer, Heráldica castellana en tiempos de los Reyes Católicos. Barcelona, 1986, 7. Ibid., and letter to the writer. Ex inf. Dr. Martin de Riquer. de Riquer, Heráldica castellana…, 307,311,305-6,310,309. Martinena Ruiz, op. cit. passim. de Riquer, Heráldica castellana…, 75.
de Riquer, Heráldica catalana…. 745-55. Martinena Ruiz, op. cit. 31.
de Riquer, Heráldica catalana…. 588. Martinena Ruiz, op. cit. : eg., ff. 41v-43, 15 shields with fesses or bars; ff. 73-74v, 13 shields with wolves. P. Adam, “Le recueil de noblesse d’Espagne fait par un historiographe du Roy Jean II nommé Cervellón, Hidalguía, Year XII, (1964), 833-56.
de Riquer, Heráldica castellana…, 69-74. Pidal de Navascués, op. cit. de Riquer, Heráldica castellana …,77. de Riquer, Heráldica castellana…, 284-311. Martinena Ruiz, op. cit. 33.
de Riquer, Heráldica castellana…, 254-5,276-9.
de Riquer, Heráldica catalana…, 594-600. Martinena Ruiz, op. cit. 42,60-1.
de Riquer, Heráldica catalana…, 587-9. P. Adam, “Traité du blason et armorial Catalan de Steve Tamburini”, Boletín de la Real Academia de Buenas Letras de Barcelona, XXIX, 1961-2, 375. Martinena Ruiz, op. cit. 63-4. Ex. inf. Dr Martin de Riquer. Martinena Ruiz, op. cit. 58-61.
de Riquer, Heráldica castellana…, 54. Martinena Ruiz, op. cit. 41,72. Adam, Traité du blason…, 361.